We reported on a Star Trek Phaser before, but that was a toy. What you see here is the real deal. Well, as real as it can probably be with DIY tech. This modded weapon is powered by a FlexDrive DC/DC, and it uses an off the shelf laser driver. In fact, I believe that it is an ordinary laser from a Blu-ray device. There is a video of this phaser after the jump so you can see it in action, and you will note how it can pop balloons from a distance. By the way, it can also burn skin. You may note that you cannot see the entire beam, as in the photo. 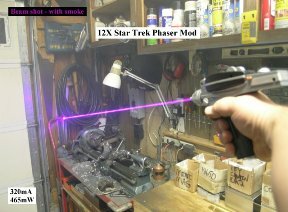 I believe the photo uses a smoke effect, which is really the only way to see most lasers. Granted, this isn’t as good as a real Star Trek phaser, and you can’t set it to stun, kill, or vaporize. Still, it is what we all want, which is a real genuine laser. It is a laser that can hurt people, and could easily cause some blindness. In other words, something tells me that even if these phasers get mass-marketed, you’ll probably need a special permit. I suppose that should come as no surprise. If you can’t wait for the day when you have to get a phaser license, you can make one right away. Check out the instructions here.